Can you spot what’s wrong with the Japanese Imperial couple’s photo? MANILA, Philippines- Several netizens have expressed their disappointment over the Japanese Imperial couple’s picture at the Rizal monument in Luneta park in Manila. 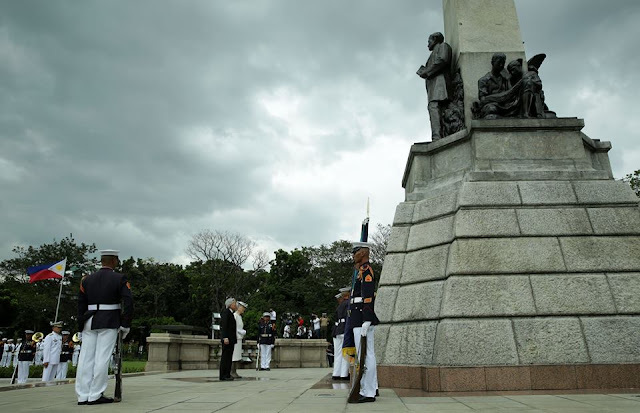 On Wednesday, January 27 Emperor Akihito and Empress Michiko laid wreath at the monument of the country’s national hero, Dr. Jose P. Rizal, to pay tribute. Manila Mayor Joseph Ejercito Estrada also appeared during the wreath-laying ceremony. A photo of the Imperial couple during the said event was shared on the Facebook page of Official Gazette. Netizens questioned as to why the photo had to be taken from the side. Several members of the online community pointed out that this was done in order to hide Torre de Manila, the infamous “photobomber” in the historic site. “Greatest photo bomber of all time.. torre de manila..haha,” commented Facebook user Jerick Rupinto. To mark the 60th anniversary of the diplomatic ties between the Philippines and Japan, the emperor and empress of Japan have visited the country for a historic five-day state visit. The two were welcomed by President Benigno Aquino III during their arrival on Tuesday, January 26 and will be staying until January 30. In 1962, Emperor Akihito and Empress Michiko visited the Philippines as crown prince and princess of Japan.